I usually book with VUELING the best Spanish low-cost air company, flying into Almeria and Granada from many European cities! You can either go for "All Inclusive Holidays to Spain" here >>, or design your own holidays by yourself. 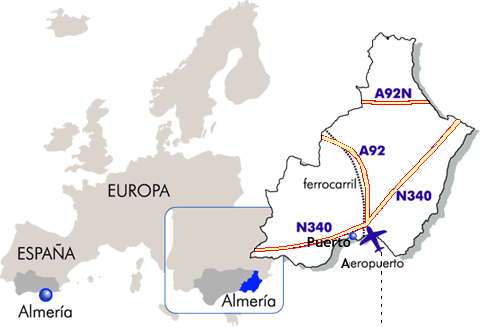 Depending on your final destination town within the province of Almeria, you may want to consider to fly into Alicante, Murcia , Granada or Malaga airport. If your destination is the Poniente Region, lets say Roquetas de Mar or Almerimar, you may also want to consider the Granada and Málaga airports (about 1 and 2 hours drive respectively). As I mentioned before, the above ' cheap European flights ' scanner brings you back ALL flights and prices available from your departure airport to your destination airport. Simply type in Almeria,Alicante, Murcia or Granada. It won't fail! The following is a list of all airlines flying into Almeria airport. However, some of them only operate during summer months. If you fly in from a non European country, you will have to choose from the following hub cities. Again, the easiest way to check is by means of the above flight search box. Bremen, Frankfurt Hahn, Düsseldorf Weeze, Berlin Schönefeld, Berlin Tegel, Nürnberg, Köln, Düsseldorf International, Stutgart, Frankfurt am Main, Munich, Hamburg International, Hannover Münster Osnabrück and Westerland Sylt. Just type in the above box your desired departure airport and Malaga as your destination airport and you will obtain all cheap flights available, some starting at 19,63 Euros!! – Awesome!